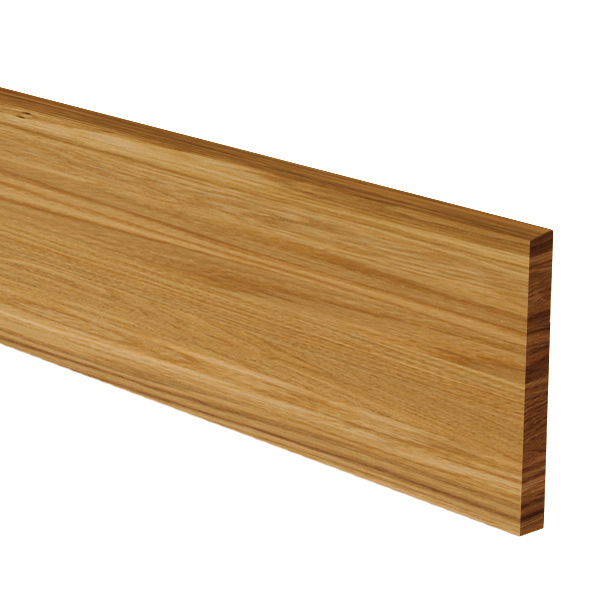 Full stave oak plinths are the ideal accessory for oak worktops. Made from the same high quality wood as our full stave oak work surfaces, these plinths run the entire length of the worktop to give a supremely sophisticated finishing touch. Solid oak plinths are an excellent alternative to tiling, too. The use of 40mm wide staves makes colour-matching easier, giving these full stave oak plinths an elegant and uniform aesthetic. Not only will our plinths coordinate beautifully with the rest of your solid oak kitchen, they also disguise the recommended 5mm expansion gap between the worktop and the wall. Complete with a square-edged finish for easy installation, full stave oak countertops have a chunky aesthetic. However - should you prefer a bespoke option - we offer a range of edge profiles for an plinths that is tailored to match your kitchen design. To find out more about the importance of quality plinths, please read our helpful plinths information guide.